As part of Women’s Month, Bakwena N1N4 has partnered with PinkDrive and the Department of Health to raise awareness around breast, testicular and prostate cancer in communities surrounding the Platinum Highway in North West Province. This year, the Pink Drive mammography truck will be stationed at Dinokana on August 17th and at Tshwelelopele Clinic on August 31st. Helping communities along its route has always been the way of Bakwena and with August being Women’s Month, Bakwena N1, N4 has partnered with PinkDrive and the Department of Health to raise awareness around breast, testicular and prostate cancer in communities surrounding the Platinum Highway in North West Province. Aimed at educating people about the various types of cancers, early lump detection and clinical examinations, the first phase of the campaign saw nurses and caregivers receive training at Dinokana Clinic on August 1st followed by more training at the Tshewelelopele and Groot Marico Clinics on August 10th, 2017. The second phase of the campaign, which involves the education and screening of the community, will take place on August 14th and 15th at Lehurutshe Clinic and on August 16th and 17th at Dinokana Clinic. On August 28th and 29th, the campaign will move to the Groot Marico Clinic and August 30th and 31st to Tshwelelopele Clinic in Zeerust. The team will also talk to learners at the schools in the areas surrounding the various clinics. This year, the Pink Drive mammography truck will be stationed at Dinokana on August 17th and at Tshwelelopele Clinic on August 31st. Bakwena’s corporate social investment focus areas include – but are not limited to – road safety, health, environment and heritage as well as social economic development. Notably, the organisation initiates extensive social development programmes among the communities along the routes it constructs, operates, maintains and builds. As a socially responsible company, Bakwena understands the importance of engaging in partnerships that strengthen systems such as health and education. 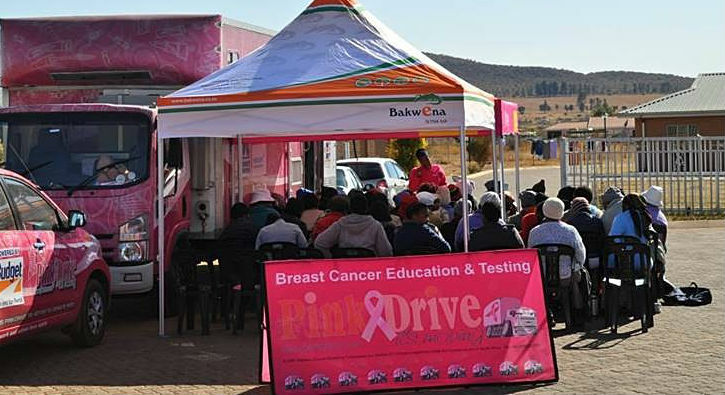 PinkDrive is a Public Benefit Organisation powering South Africa’s first mobile mammography and educational unit and taking its message that ‘Early Detection Saves Lives’ to communities throughout South Arica. To date, PinkDrive has conducted 11 828 mammograms, 120 192 clinical breast examinations and educated 306 749 586 women on breast cancer. Well done to Bakwena on supporting this fine initiative. By so doing, they help to empower, educate and equip women, children and men with the necessary information to manage their health more effectively.